Integration module Consume data Connector for Microsoft Office 365 Main menu: Microsoft Office 365 / New data source or Edit an existing connection General / Click on "Next"
Opens the website where the Intrexx portal can be registered as an app. Click here for more information. Enter the Application ID from the registration. The App ID can be stored in a field in the User Manager for each user. Select the corresponding field here. 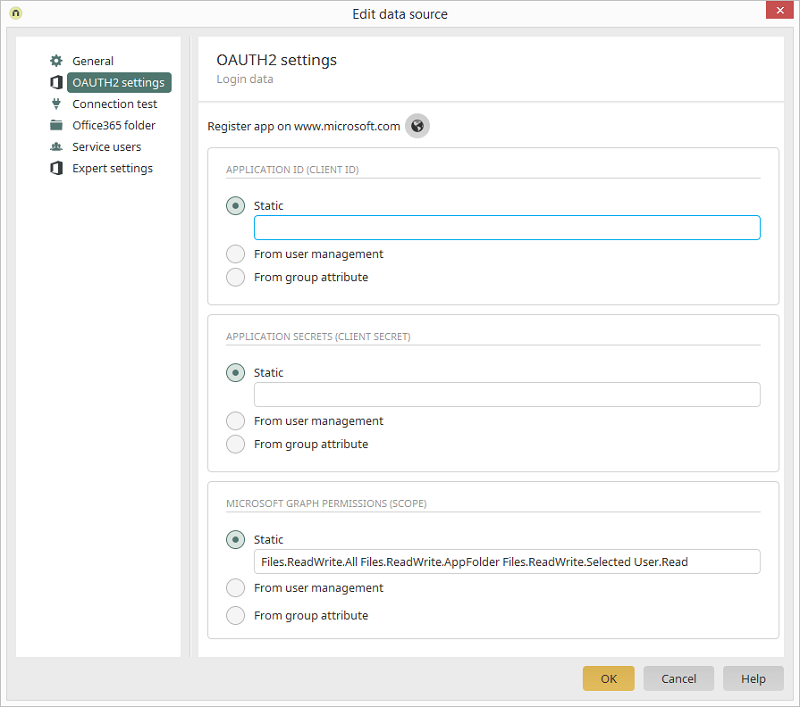 The App ID can be stored in a field in the User Manager for each user group. Select the corresponding field here. Enter the password from the registration. The password can be stored in a field in the User Manager for each user. Select the corresponding field here. The password can be stored in a field in the User Manager for each user group. Select the corresponding field here. Enter the scope from the registration. Separate the individual entries with a space. The scope can be stored in a field in the User Manager for each user. Select the corresponding field here. The scope can be stored in a field in the User Manager for each user group. Select the corresponding field here.